Home / General / News / 3 types of distracted driving (and tips to steer clear of them). In the U.S., distracted driving is a dire problem. Every day, approximately nine people are killed and more than 1,000 people are injured – which means every year, 368,285 people are ultimately affected. Of course, most people understand what distracted driving is, and even how dangerous it is. But what many don’t know is that there are actually different types of distracted driving. Distracted driving is anything that takes your eyes off the road, hands off the wheel or mind off the drive. Chances are, when you think about distracted driving, you’re thinking about a visual distraction. It’s what most people associate with distracted driving because it’s what makes the most sense. When a driver takes their eyes off the road, even if it’s just for a split second, they take their focus off the road as well. It makes these distractions especially dangerous because drivers can’t consistently assess their surroundings. A manual distraction is when a driver takes their hand(s) off the wheel for any reason, for any amount of time. Without both hands on the wheel, your reaction time suffers, and so does your ability to steer. Let’s say you have one hand on a knob and suddenly, a deer darts out in front of you. It takes at least a full second to bring your hand back, and in that instant, you could crash right into the deer. Not driving with two hands (preferably at 10 and 2) can cause you to veer off the road or into oncoming traffic – and we definitely don’t want that. Cognitive distractions are deceivingly dangerous because you can look like you’re doing everything right. You can have your eyes on the road and your hands on the wheel, but if your mind is drifting, you’re still distracted. To put it simply, when something else has captured your attention, you’ll probably have a hard time concentrating. You won’t be as alert, which means you won’t be as safe. What’s missing from the descriptions above? If you noticed texting and driving was never offered as an example, it’s because it doesn’t fall into just one category. Believe it or not, texting and driving is dangerous because it combines all three kinds of distracted driving. When you’re using a smartphone, you’re taking your eyes off the road, hands off the wheel and mind off driving. So, it’s a triple threat – literally. Feeling determined to be a better driver? Don’t worry, we’ve got you covered. 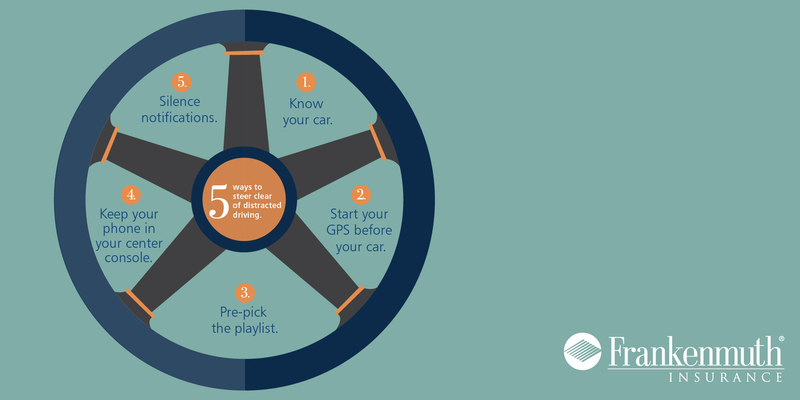 Discover our quick tips to help you steer clear of distracted driving. And make sure you don’t get distracted from reviewing your insurance annually either. To find out if you’re properly protected, talk to us. An agent near you is now available.